Are You Nutty for Pecans? If you are interested in pecans, especially growing pecans, you might want to check out this blog: Northern Pecans. Dr. Bill Reid, our Pecan Research & Extension Specialist has been writing this blog since last fall. The posts and pictures talk about insects and disease, research topics, harvest, weather, and pretty much anything you might want to know about growing pecans. Check it out! 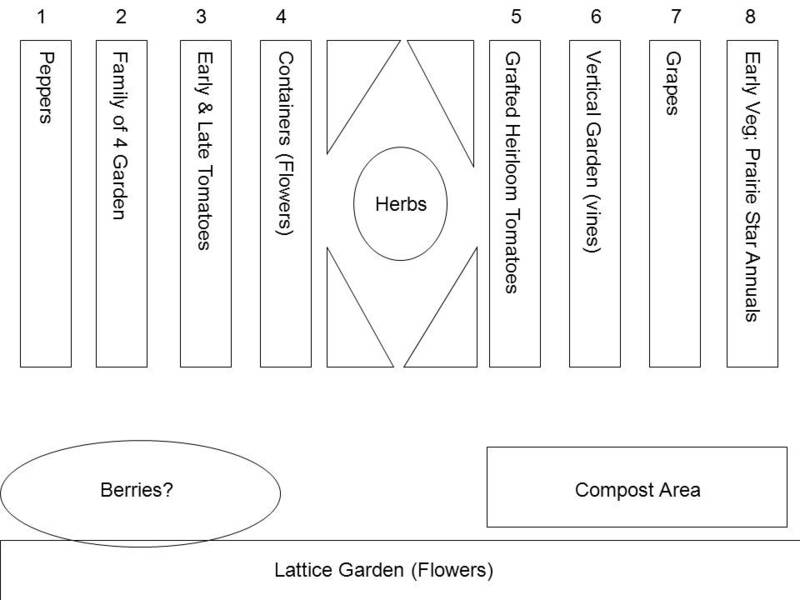 Sneak Peak at 2011 Garden Plans! We had our initial meeting of the Demonstration Garden this week to start our planning. We don’t have all the details nailed down yet, but here’s a look at what we’re planning for the different beds this year. Locally grown vegetables are fresh, delicious, and can boost the local economy. The second annual Central Kansas Market Vegetable Growers Workshop, sponsored by Sedgwick, Butler, Harvey, and Reno County Extension, will give beginning and experienced vegetable growers new skills to improve their production methods and marketing skills for selling their local vegetables, while meeting an increasing demand for locally grown produce. Featured speakers include Dan Nagengast of the Kansas Rural Center and other Kansas fruit and vegetable producers. The workshop will cover the basics of vegetable production with a special emphasis on techniques for extending the harvest season for vegetables. Topics will include: high tunnels, tomato grafting, berry production, winter greens production, agritourism, and community supported agriculture. The workshop will be held February 12, 2010 from 8:45 a.m. to 4:30 p.m. in 4-H Hall at the Sedgwick County Extension Education Center at 21st and Ridge in Wichita. Cost of registration is $20 before February 4, 2010 and $25 after. Register online at http://vegetablegrowersworkshop.eventbrite.com or by calling 316-660-0144. You can also download the brochure Central Kansas Veg Growers Workshop (PDF) for complete details and a registration form. For more information, please call Rebecca McMahon at 316-660-0142. Can you believe that it’s time to pore over catalogs and start planning the garden for 2011? We are having our first planning meeting for the Demonstration Garden next week, and I already know there are some great ideas for this summer! Here’s the first step in the grafting procedure. 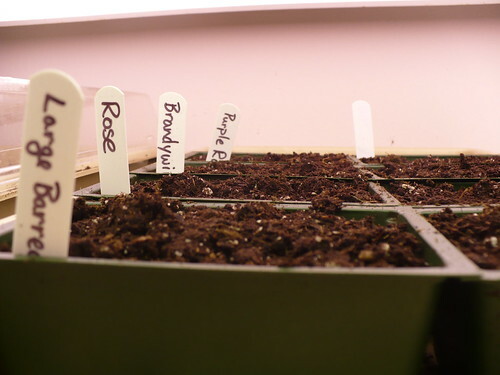 I planted some seeds of 4 types of Heirloom tomatoes that I had on hand (Large Barred Boar, Rose, Brandywine, and Purple Russian). On the other side of the tray are the rootstocks, which are the variety ‘Maxifort.’ It is intended to be a rootstock variety, so it isn’t a commonly know variety. Theoretically you could use a regular hybrid that is disease resistant. What I’m hoping to learn from this planting of seeds is how long it takes all of them to germinate. (This will be even more exciting, since all the seeds are older!) If they all happen to germinate within a 2 day window, then I will try the grafting technique when the plants reach the right size. If they don’t germinate within a 2 day window, then I will replant, staggering the plantings to get them to germinate at the same time. It should be a fun experiment for the late winter! I happened to see this link pass by on Twitter this afternoon, and I thought it was an interesting article. Have you noticed that certain varieties of what you grow are just better flavored? I notice it most with lettuces in the spring. Some will taste sweet even if we have some warmer weather, and others will be bitter after a little heat.